(Newser) – The University of Missouri says it will continue to use live pigs to train emergency room doctors, despite protests. Last week, the Physicians Committee for Responsible Medicine organized a rally outside University Hospital to advocate ending the use of swine in physician training. The demonstration came after the university's Animal Care and Use Committee voted earlier this month to continue the practice through November 2020. The protocol used by the university says the eight residents accepted each year for the three-year program need six pigs for every six-month session to complete the training. Each pig is anesthetized before training begins and then subjected to eight procedures, which include opening the chest to reach the heart and cutting an airway into the throat. The Columbia Daily Tribune reported in July the pigs either die during the course of the procedures or are killed before the last part by the residents, who perform a post-mortem technique in which fluid is drained from the sac around the animal's heart. 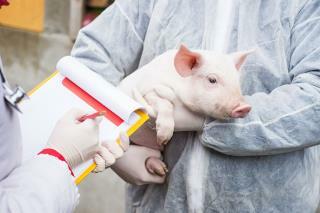 But retired ER physician Kerry Foley said none of the training requires a pig. She said it would be more helpful for students to learn on clinical anatomy models. "You can now obtain things called perfused cadavers, which are very lifelike and true to the experience of working on real patients," Foley said as she picketed outside the hospital. In a statement to the Tribune, Missouri officials said it isn't possible to complete training only with simulations. A survey conducted by the physicians committee found only 16 of 211 emergency residency programs in the US and Canada use pigs to train doctors, reports the AP. Is that before or after the bacon and egg sandwiches? Must be the PETA freaks..... You know the ones that...... Have leather car interiors, leather wrapped steering wheels, wear leather belts, wear leather shoes, wear leather gloves, maybe even have leather covered furniture, wear suede jackets, wear makeup tested on animals, use medical services based upon animal testing TO SAVE THEIR HYPOCRITICAL LIVES, etcetera, etcetera, etcetera. so after training.. its BBQ time! Who wants ribs? ?